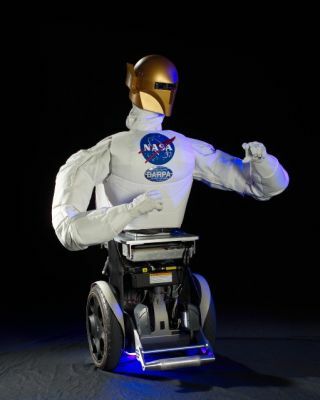 Robonaut B's upper body can attach to a Segway-built robotic mobility platform (RMP) in order to drive on Earth. Not content to simply stand in one place, NASA's mechanical astronaut has found not one, but two new bodies that will allow it to move across land and space. Robonaut B, a robot built with human-like hands and television camera eyes, now has the option of rolling around Earth on a modified two-wheeled Segway scooter or grappling the International Space Station (ISS) with what researchers call a "space leg." "We built Robonaut B to be portable," said Robert Ambrose, robonaut project lead at NASA's Johnson Space Center (JSC) in Houston,Texas. "It really exceeded our expectations." The second in the robonaut series, Robonaut B is a self-contained robot controlled remotely by a human operator. Future incarnations of the mobile robot could prove vital companions for astronauts living and working on the moon and in space. "We're looking at other lower bodies for the moon, with a four-wheel or six-wheel base," Ambrose told SPACE.com . "We're not going to take a Segway to the moon, but it's a good way to emulate the idea on Earth." The robonaut project is a collaboration between NASA and the Defense Advanced Research Projects Agency (DARPA). Increasing Robonaut's mobility has been a prime goal for project researchers, though it is also designed to attach to the robot arms aboard the space shuttle or the International Space Station (ISS). Among the biggest challenges was combining Robonaut's arm and hand functions with its newfound mobility in a way that a human operator could easily use. "It's an interesting challenge, and humans do it beautifully," Ambrose said of the coordination between mobility and manipulation. "Just look at the coordination of the athletes in the Olympics." Robonaut B's wheeled tests proved one human could remotely operate the robot's mobility and manipulation systems simultaneously. It rolled from test station to test station, a smooth combination of robot and rover. Using it's "space leg," a kind of adapter that allows Robonaut B to plug itself into the same ISS ports astronauts use for their foot restraints, the robot demonstrated its ability to move hand-over-hand outside the space station and use tethers like its human counterparts. That skill, in particular, could come in handy aboard the ISS, researchers said. "A lot of things, like spacewalking where humans have go from an airlock to a specific site, mean you have simply got to get where the work is," Ambrose said. Since Robonaut B is portable and wireless, its internal systems are much smaller than those of its older brother Robonaut A. "We basically scrubbed everything and replaced all of the electronics with much smaller miniature versions," Ambrose said of the newer robonaut. Robonaut A is stuck in a fixed location at a JSC lab, where engineers test new autonomy hardware and software that could later be applied to the portable version. "We have tried out a couple of different levels of autonomy [for Robonaut B]," Ambrose said. The robot is programmed to protect itself from damage in the event of human error. Robonaut B won't, for example, drive through a brick wall if a tele-operator commands it to. It can also be told to pick up certain objects without specific motion directions, a useful skill on missions with five or 10 seconds delays in communications. The next step is developing a spaceworthy robonaut for flight tests, either aboard the space shuttle or the ISS, Ambrose said, adding that human-robot cooperation can play an important role in space exploration. "If I were going to the moon, I would want a habitat already there and something to check that it is airtight and that oxygen is being produced," he said. "A robot can check that."